1. Preheat a nonstick frying pan over medium heat. 2. Mix together flour, baking powder, and sea salt. Stir in the lemon zest, poppy seeds, and blueberries. 3. Add the lemon juice to the vanilla soy milk. Set aside for 5 minutes. 4. Stir sugar into the vanilla soy milk + lemon juice. 5. Stir the melted coconut oil into the dry ingredients. 6. Add the soy milk/lemon juice/sugar to the dry ingredients. Use a fork to mix well, until there are no lumps in the batter. 7. Spoon ¼-1/3 cup of the batter onto your preheated pan. Cook the first side for about 1-2 minutes – until the edges appear dry and cooked. Always flip the pancake before dry spots begin to form on the tops of your pancakes. 8. Flip and cook for another 1-2 minutes. 9. Store the cooked pancakes in a single layer on the racks in your warm oven – this will keep them warm but not soggy. 10. Continue cooking the pancakes until all the batter is used up. Makes about 6-7 pancakes. Ooooh, this looks yummy! 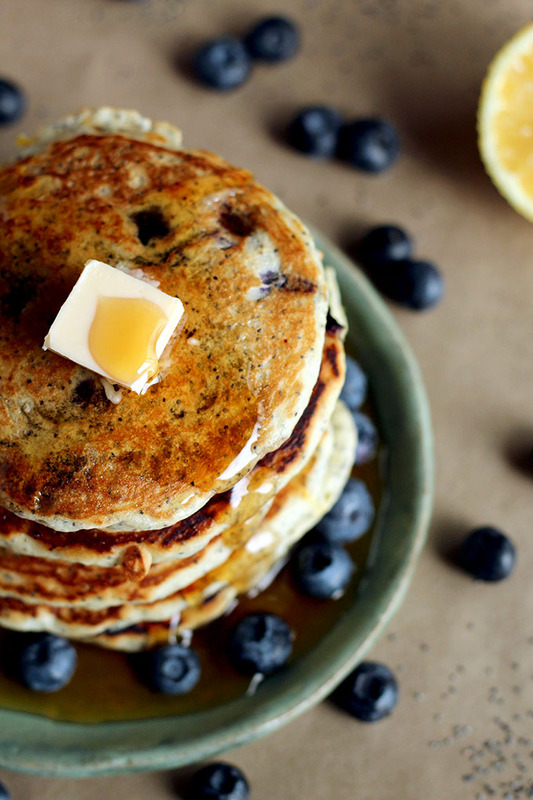 Lemons and blueberries–can’t go wrong. Now all I have to do is switch out the flour for a gluten-free mix and I’ll be good to go.